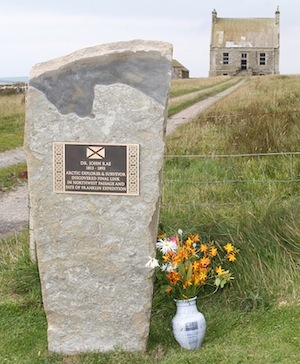 A stone and plaque commemorating Dr. John Rae was unveiled at Clestrain House in Orphir in 2015. The John Rae Society has announced that it has completed the purchase of the Hall of Clestrain from its current owners Ivan and Jean Craigie, and now plan to fully restore the building. The Hall of Clestrain, an 18th Century Palladian building situated in Orphir, was the childhood home of John Rae, the famous Orcadian Arctic explorer, who not only discovered the final part of the North West passage but also what had happened to the previous ill-fated Franklin expedition. Despite his numerous achievements, Dr Rae was almost written out of history after reporting the crew of the Franklin expedition had resorted to cannibalism in a desperate attempt to survive. The society plans to restore the hall to its former glory and to open it to the public as well as making the area around it a key visitor attraction in Orkney. The aim now is to embark on a major campaign of fundraising and to approach other organisations to assist it with the project. Next Post>‘Grand Tour’ broadcast date . . .